Showing results for tags 'archimandrita'. Friendly male-male interactions after molt? Today I managed to capture a video of another of my Archimandrita males hissing when disturbed. 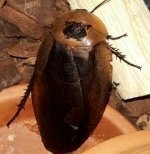 Anyone else with hissing Archimandrita roaches?